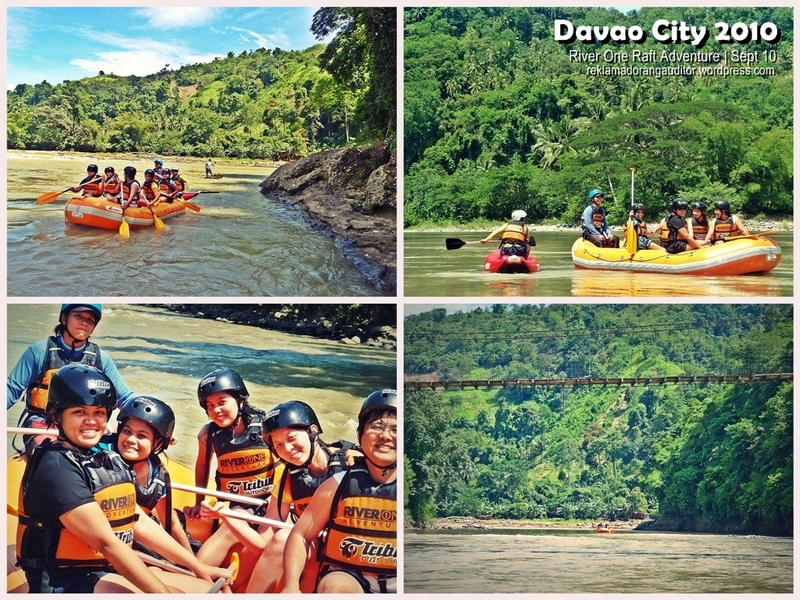 The rafting adventure was included in our itinerary, but it has a separate fee. The activity was organized by River One Adventure, (now known as Base Camp)–you may click here to visit their site (I’m not sure if they got an updated site ’cause it hasn’t been updated in years already, but the latest comment mentioned about River One changing its name to Base Camp). The River One / Base Camp headquarters was previously located in 16 Paseo de Roxas Commercial Complex, Manuel Roxas Avenue, Davao City but recently moved to Door 89 Madrazo Fruit Complex, C. Bangoy Street, near Jobs Academy. We were at the headquarters at a little past 6am! :) Ang aga! At about 6:30am, we were already registering. And then Kuya TourGuide (I’m sorry I forgot the name of this guy ehehe!) 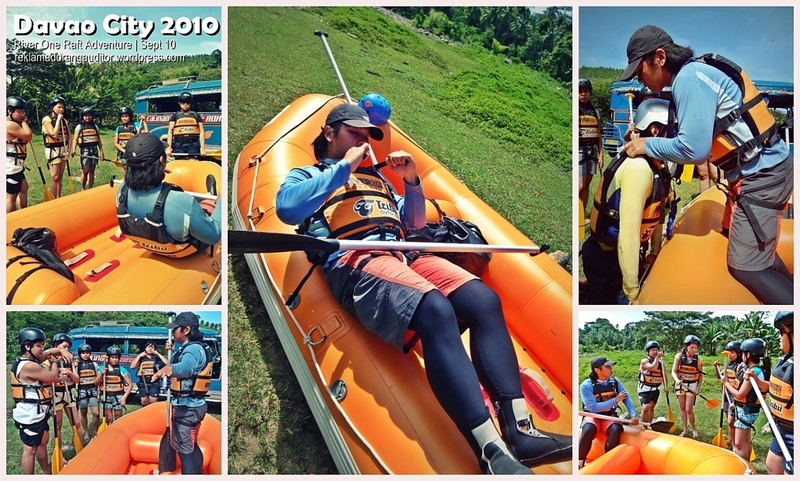 gave a briefing on how to go about the rafting—demonstrating how to paddle (the easy and the hard way), what to do when the rubber boat gets capsized by the rapids, how to rescue if someone gets thrown out of the rubber boat, etc. After the briefing, we were all set to get into the rubber boat! 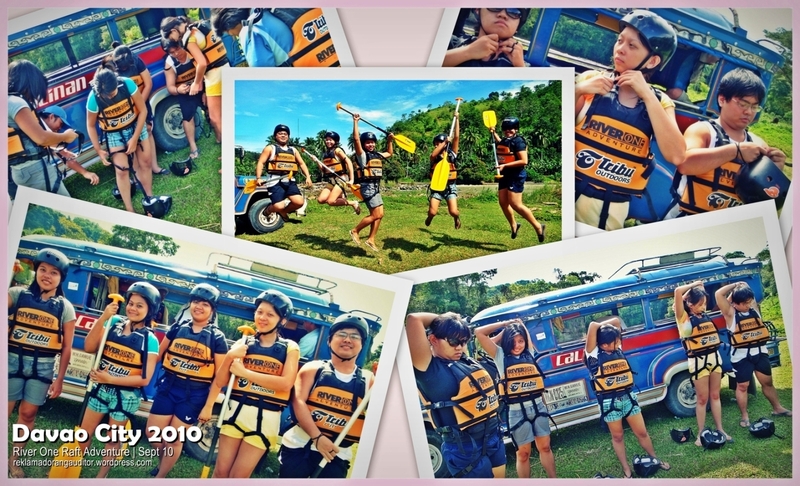 After the so-called practicum, we were all ready for the rafting adventure!!! 3 tour guides accompanied us, and there were no other tourists around ehehehe! 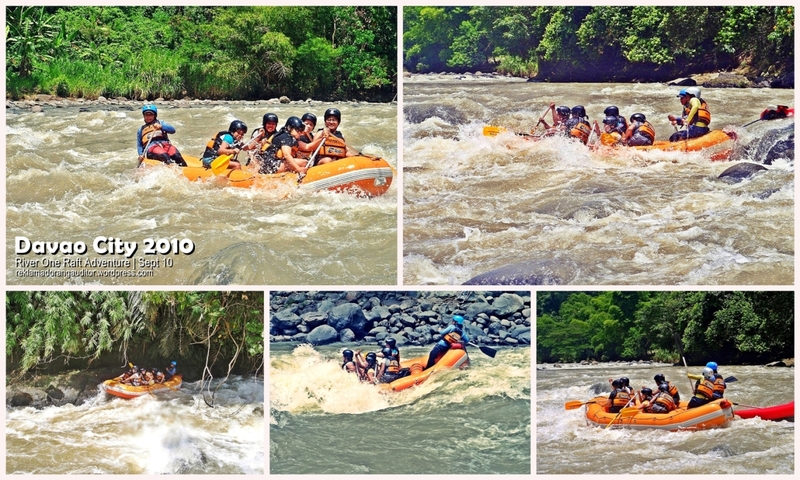 Solo namin ang river! :D One of the tour guides went with us sa rubber boat, each of the other two guides (who were using the Kayak) served as our photographer/videographer and backup (in case the rubber boat will be capsized by the rapids), respectively. And when the river’s mad! After about an hour, we headed back to the hotel to prepare for the zip-lining activity at Zip City. 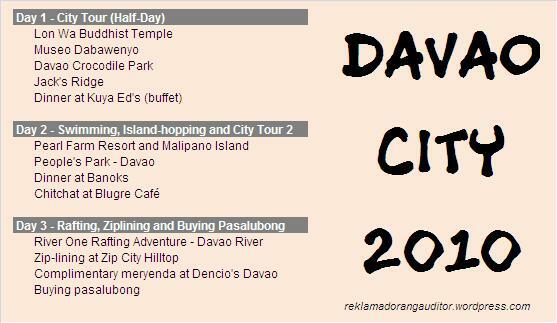 Address: Door 89 Madrazo Fruit Complex, C. Bangoy Street, near Jobs Academy. The Zip City Zipline is located in Davao City Hilltop which sits on a high, steep slope, hilly part of the Barangay Langub, Diversion Road, Ma-a, Davao City overlooking the beautiful scenic expanse of Metro Davao. After zip-lining, we took our afternoon snack in Dencio’s Kamayan, which is just across the zip-line spot. Then we headed back to our hotel to checkout. The bad thing about this trip was, our tour agent wasn’t prompt enough in paying the hotel bills that’s why we got held for almost an hour. We haven’t got enough time to buy pasalubong—we just made stops along the way to the airport to buy some Davao goods as pasalubong. :) Hassle! Oh well!